No body part takes on more abuse over the course of a dog’s lifetime quite like their joints. So it’s not too surprising to see joint pain and dysfunction occur over time. There are plenty of joint supplements available on the market to help, but which ones are best? It’s no secret that dogs put their joints through a lot every day, from romping around during playtime to jumping up on the couch so they can give you kisses. This combination of repetitive motion and active stress can take its toll on their legs, hips, and shoulders. The effects of this toll tend to occur more subtly than you might think. While your dog may not exhibit joint pain until the latter half of his life, the building blocks for joint diseases are laid down well before they reach senior status. The conditions your pooch can develop are wide ranging, from developmental disorders like hip dysplasia to degenerative conditions like osteoarthritis. The onset and cause of joint pain vary from breed to breed. However, it's generally accepted that larger breed dogs are more susceptible to this type of ailment than smaller breeds. This is because the big buddies have more body weight to lug around than their tiny counterparts. It’s pretty hard to miss when your dog starts to suffer from joint pain, as the physical clues he’ll give you won’t be too subtle. You may notice your four-legged friend limping, favoring a particular limb, and a reluctance to jump or even move at the early stages of joint pain. When the pain becomes more intense, simple tasks like walking up the stairs or even rising from a sleeping or laying position might be difficult to near-impossible. At this point, he may start vocalizing his discomfort through yelps and whimpers. Ideally, you’ll want to be proactive with your pooch and take care of the issue before it reaches this latter stage. That’s the underlying mission of joint supplements. They won’t suddenly make your dog the robust athlete he was during his younger days, but they can make it easier for him to do the basics with minimal pain. If you feel your dog’s pain is too much for him to handle, you shouldn’t immediately start giving him joint supplements. You should schedule an appointment with your dog’s veterinarian first. Your vet will give your pooch a thorough examination to ensure the cause of his discomfort is joint-related and not something else, like a fracture. Your vet may also feel your pooch’s pain is bad enough to warrant a prescription anti-inflammatory pain reliever, such as Rimadyl – think aspirin for dogs. This prescription doesn’t necessarily take joint supplements off the proverbial table; it is possible for a pooch to be on a joint supplement and an anti-inflammatory at the same time. What Do You Look for in a Dog Joint Supplement? One thing you may notice as you start perusing joint supplements for your pooch is that some of what’s available appear to be similar to the joint supplements available for humans. If you take something for your own joints, you may recognize a lot of similar ingredients on the label. If this is the case, don’t think you can split your supplements. There are a few differences that make sticking to the dog version for your pooch essential. For instance, dog joint supplements contain ascorbic acid, which makes it easier for the ingredients to be absorbed by a dog’s body. Canine joint supplements also tend to be flavored to make them more appealing to ingest. With that being said, there are some specific ingredients you should look for when you pick up a supplement for your pooch. Glucosamine HCL, chondroitin sulfate, and hyaluronic acid are all considered joint building blocks that will help restore strength to the affected areas. A supplement should contain at least two of these ingredients. While these building blocks are the main elements you should look for, they aren’t the only ingredients that make a joint supplement worth considering. Be sure to keep an eye out for things like perna mussel, creatine, and methylsulfonylmethane (MSM); substances that have been shown to support joints and even build muscle mass. You may also want to consider joint supplements that contain various vitamins and minerals that are known to promote good canine health in general. Some of the key elements that fall into this category include Vitamin C, Manganese, Omega-3 fatty acid, and Omega 6 fatty acid. You should also be mindful of herbs like alfalfa and yucca. Providing your pooch with a dog joint supplement may help reduce the pain your pooch feels, but it should not be the sole course of action you take to help improve his condition. There are a few natural steps you can take that when coupled with joint supplements, can help your pooch perform and feel his best. Weight management plays a massive role in joint regulation. If your pooch is overweight, he’s putting a significant amount of excess stress on his limbs, which could only exacerbate his painful condition. Work with your vet to come up with a strict but fair dietary regiment to help your dog shed those unnecessary pounds. In this same vein, you and your vet should concoct a simple exercise plan to get your dog out and about. This may seem counter-intuitive at first glance, but a series of easy, low-impact exercises will help the joint and muscle building qualities of a joint supplement work with greater efficiency. Finally, don’t forget the power of warmth, especially if you live in an area prone to cold wintry conditions. Cold temperatures tend to worsen joint pain in dogs, just as it does with humans. Therefore, be sure to provide a warm and cozy living and sleeping environment for your pooch at all times. While the underlying goal of any dog joint supplement should be to get your dog mobile and pain-free, there may be other intangibles the product offers that are worthy of attention. Such intangibles make the Green Paw Pets Jumping Joints and Hip Supplement worthy of consideration. 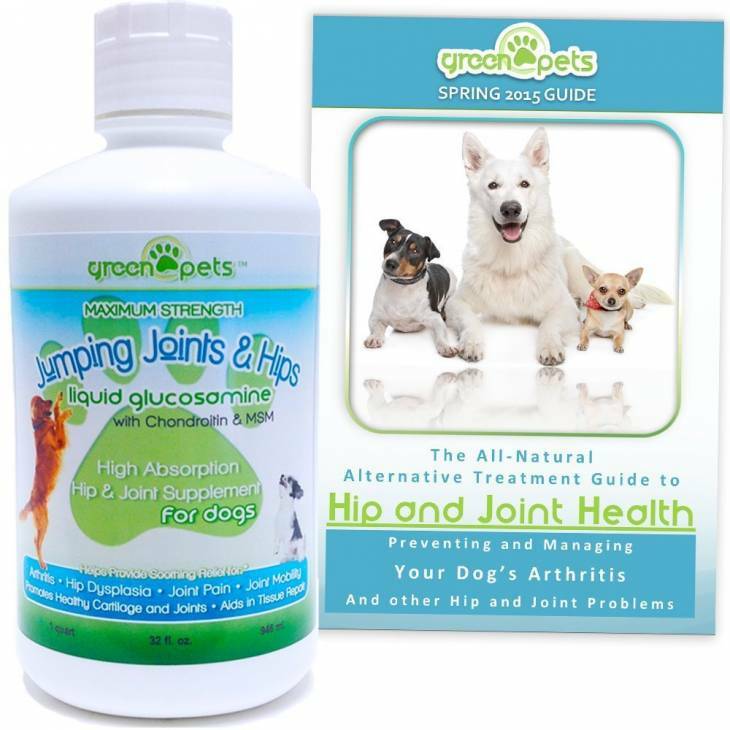 This liquid glucosamine supplement is purported to work fast – most users claim their dogs showed better mobility within a week. But not only with this product help your dog, but it will also help other pooches. 100 % of the proceeds from each sale goes directly to animals in need, such as those in no-kill animal shelters. This is a noble cause, simply because the needs of some dogs such as shelter dogs can easily be overlooked simply because of their environment. By purchasing this product, you’re helping more than just the dog in your home have a better life, which should make you feel pretty good. Your dog will feel pretty good, too. A good dog joint supplement will be not only loaded with essential stuff to build and strengthen joints, but it will also contain other nutrients that will help ease the pain as your pooch gingerly walks the road to recovery. 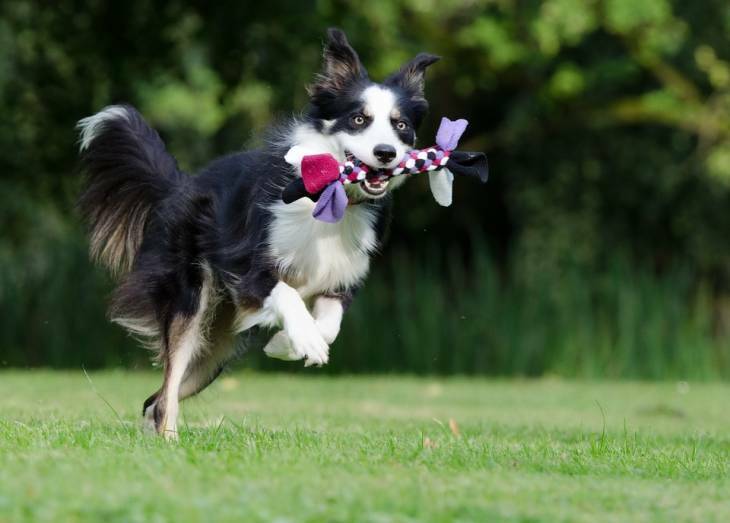 Doggie Dailies Advanced Hip & Joint Supplement for Dogs gets high marks because of what they pack in each soft chew. The chews contain the joint-building materials you’re looking for in a supplement, such as glucosamine, chondroitin, and hyaluronic acid. It also contains yucca and other key enzymes to lubricate joints, which makes easier for dogs to become mobile. This increase in movement makes the joint-strengthening process happen more efficiently. 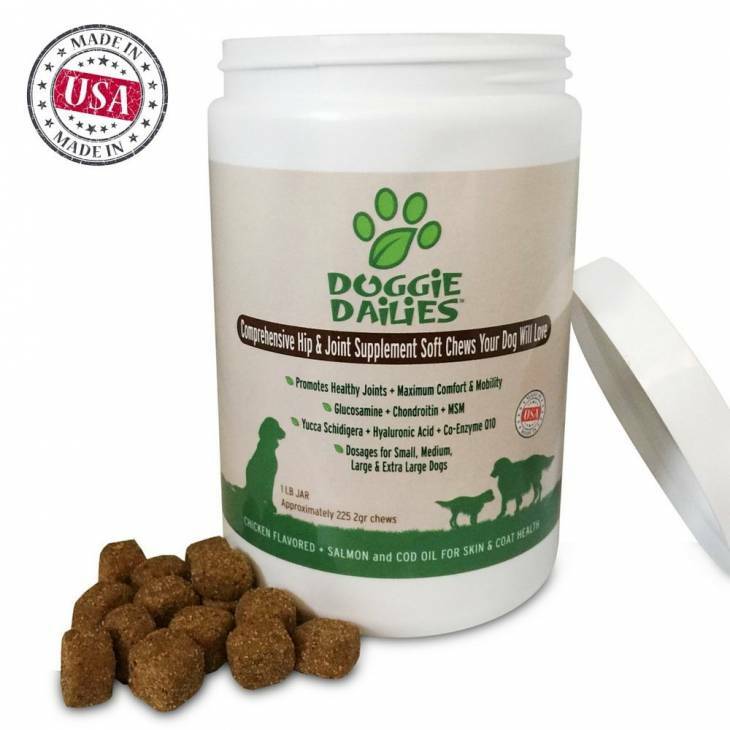 There are also other elements in this product that can improve your dog’s overall health beyond his joints. The presence of Omega-3-rich ingredients like salmon oil and cod liver oil helps maintain your dog’s skin and coat. Other enzymes present will also give your dog’s energy a boost – something that may be needed once he starts feeling better. It's tough to watch your dog suffer from joint pain from the moment he starts exhibiting signs of discomfort. Thankfully, dog joint supplements make it possible for you to do something, as opposed to sitting idly by and helplessly watching him suffer. There is still a process behind getting your pooch from point A to point B, such as vet visitations and various levels of product research. However, the joy of seeing your buddy go from being deep in pain to his normal happy, fun self makes all of the steps needed in this process worth taking. To be sure, your dog will be very pleased you did. Pup at Play: What are the Best Toys for Rottweilers?